The Engineering Research Center (ERC) Observatory project is a collaboration between the CNS Center at Indiana University and the nanoHUB Team at Purdue University. As the premier community for computational nanotechnology research, education, and collaboration, this project, hosted on nanoHUB.org, serves as a portal to novel dashboard interfaces and visualizations of collaboration networks and science maps generated for engineering research centers (ERCs). 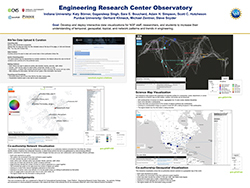 The interactive data visualizations were designed for NSF staff, researchers, and students to increase their understanding of temporal, geospatial, topical, and network patterns and trends in engineering. Through the ERC Observatory, key stakeholders can use advanced data mining and visualization techniques to inform data-driven resource allocation, priority setting, but also career decisions related to the centers. The interface allows ERC users to upload their publication data and curate this data in order to provide access to clean and correct records. For example, one author might be represented by multiple variations of their name, and the online interface allows users to find all variations and combine them to a preferred name. In addition, author roles (faculty or student), gender, and geolocations can be added in support of geospatial visualizations. After edits are made, the user can request three different types of visualizations; the user can also download the updated publication file. Identify strong co-author linkages that likely serve as main collaboration and knowledge diffusion pathways. This interactive map supports the exploration of expertise profiles of a researcher, center, department, or university that are overlaid on a science map so that outliers, clusters, and trends can be recognized. The map visually represents 554 subdisciplines of science and their relationships to one another. All of these 554 subdisciplines are grouped into 13 overall color-coded disciplines. The visualization reveals what research areas a particular center’s publications focus on and how this topic profile evolves over time. This interactive visualization shows the co-authorship network overlaid on a geospatial map of the world. Each node represents an author and two authors are connected if they have authored a paper together. The geospatial reach of an effort can easily be seen as can local clusters and major collaboration backbones.